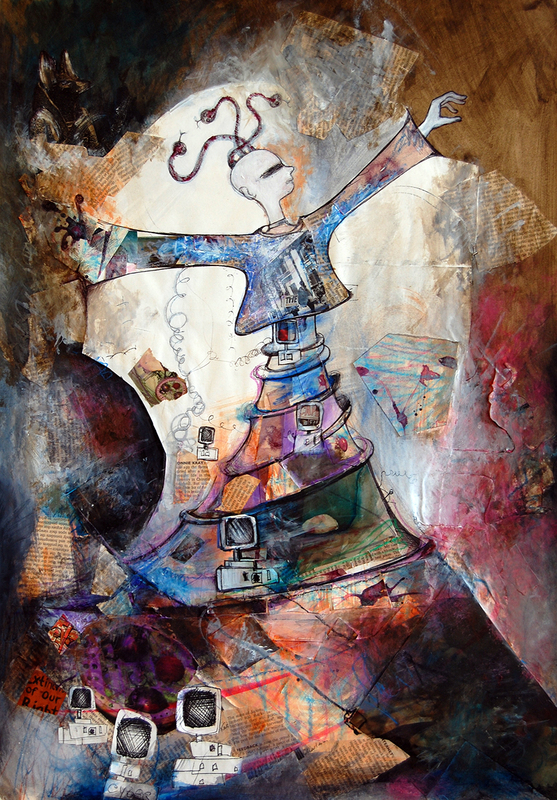 The Tower of Babel by Barbara Agreste, Painting: acrylics, collage, ink on card. The story of the Tower of Babel explains the origins of the multiplicity of languages. God was concerned that all humans united by a single language, had too much freedom to do as they wished, so he brought into existence multiple languages dividing humans into linguistic groups, so they would be unable to understand one another. When He did so, the tower was left unfinished, and humans scattered over the face of the earth. There have also been a number of traditions around the world that describe a divine confusion of the one original language into several, therefore there is evidence of a primordial language that was peraphs common to all humanity. The Greek form of the name Babylon is from the native Akkadian Bāb-ilim, which means “Gate of the god”, the Tower of Babel was a gate for humans to reach a divine state and power for themselves, and what interrupted this process was either God’s rage against humans and his mistrust of them, or a weird turn in hystory that from a positive and armonious coexistence of humans with the other creatures of Nature, brought them to expand in a way which went against it. Babel Tower – Appreciate it for all your efforts that you have put in this. Very interesting info . “You can’t help someone get up a hill without getting closer to the top yourself.” by Gen. H. Norman Schwarzkopf.